Demolition – Coronet Construction is an established Chicagoland area contractor specializing in complete building demolition and select demolition for renovation. 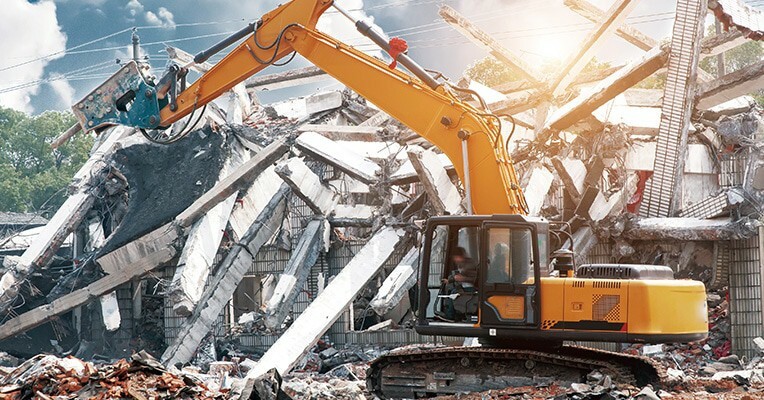 Here we present a few key industry terms and some useful basic information about Demolition to help our customers make an informed decision when considering this essential construction industry service. For a FREE QUOTE on our Demolition services, excavation or concrete services just call Coronet Construction at 630-835-0700. * The procedure is basically how a building is demolished and removed from a site to prepare for new development. * The sophisticated gear, technology and equipment our teams use include a variety of excavators, cranes, loaders and backhoes in addition to specialized attachments like wrecking balls. Other essential gear includes safety equipment like respiratory protection, filtration systems, plus recycling and disposal technologies. * Implosion – explosives are used to cause the collapse of a building. Explosives are only used in a very small percentage of demolitions. It’s a highly specific part of the process that requires a thorough working knowledge of structures and use of explosives. * The safety guidelines we adhere to are for the purpose of keeping our employees safe and keeping our job sites safe too. These safety practices include occupational health standards, safety regulations, training, and environmental methods to safeguard the public. Coronet Construction puts the highest priority on quality work and good relationships with our customers. We’ve been providing professional services since 1996 – let us perform a FREE QUOTE for your next project!